An Opinion On Sports: Matthew Stafford: Heart of A Lion! Matthew Stafford became the youngest rookie quarterback to throw five touchdown passes in a single game yesterday. But it was his fifth one that showed what Stafford is made of. Running back on to the field after a shoulder injury on the previous play, Stafford drilled the game winner before leaving the field again in obvious pain. 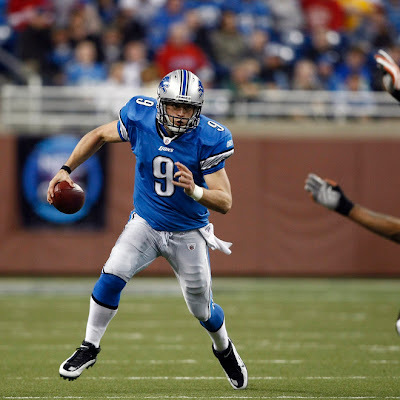 His Detroit Lions defeated the Cleveland Browns 38-37 for their second victory of the season. The Lions only managed one victory in the entire 2008 season. Stafford was matched up against his former Georgia Bulldog teammate, Browns receiver Mohamed Massaquoi. "Mo-Mass" had 5 receptions for 115 yards and one TD. When the Lions made Stafford their first selection in the NFL Draft, they knew he had the talent and ability they needed in a young quarterback to build a franchise around. Now they know he has the heart, desire and toughness. He will lead the Lions to many more comeback wins before it's all said and done. Here's hoping Matthew will be well enough to play in Detroit's traditional Thanksgiving Day game this Thursday.